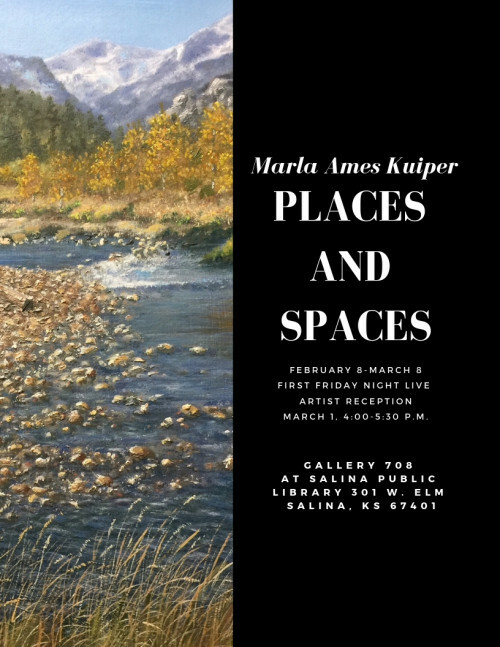 “Places and Spaces”, an exhibit of plein air oil paintings by Salinan Marla Ames Kuiper, will be on display Feb. 8-March 8 in Salina Public Library’s Gallery 708. A First Friday reception for the artist will be from 4-5:30 p.m. March 1, in conjunction with Friday Night Live. At an early age, Kuiper developed an interest in drawing which continued throughout her school years. In college, she concentrated on drawing and oil painting receiving a B.A. in art and education from Fort Hays State University. After teaching art at both the elementary and secondary levels, she began pursuing painting seriously as a stay-at-home mom. During this time, she sold nearly 200 paintings and drawings, took part in numerous art shows, and was featured in the Salina Journal.